In the Main Menu, click Lists, Insurance Carriers. You can also access the carrier list by clicking [...] on the Insurance Plan window. Carrier/Phone: As you type, only matching entries will list. Show Hidden: Include/exclude carriers that have been marked Hidden. To update carrier information, double click it. If multiple entries for the same carrier exist due to data entry errors, you can combine them. See Combine Carriers. Carrier ID: A system generated unique identifier that is useful for third party reporting. Name, Phone, Address, Address2: Carrier name and mailing address. Electronic ID: The electronic ID used when submitting e-claims. Insurance companies will provide you with the correct number. Send Electronically: Determines the carrier's default setting for Send Electronically on the Insurance Plan. Send Claims Electronically: Allow sending E-Claims to this carrier. Don't Send Claims Electronically: Do not allow sending e-claims to this carrier (e.g. if you must print and mail). Don't Send Secondary Claims Electronically: Do not allow sending secondary e-claims to this carrier (e.g. when carrier requires that secondary claims are mailed with a copy of the primary EOB). Carrier Group: Only visible if carrier group names exist in Definitions: Carrier Group Names. Select a carrier group to associate to the carrier. Useful for queries. Hidden: Hide this carrier so it is no longer available as a selection. Appt Text Back Color: Background color for the carrier's name in the appointment box when Insurance Color is added to the appointment view. See Appointment View Edit. 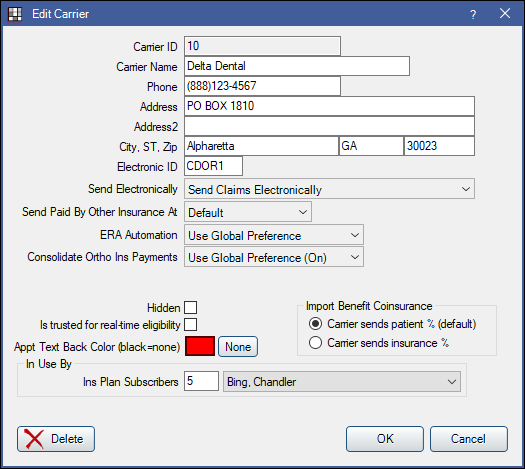 Import Benefit Coinsurance: When importing benefits using Electronic Eligibility, select how Open Dental imports received carrier benefit information. This affects insurance estimates. Carrier sends patient % (default): The carrier will send the percentage covered by the patient. Open Dental will import this as the percentage covered by insurance. For example, if patient pays 20%, Open Dental will import this as Insurance Pays 80%. Carrier sends insurance %: The carrier will send the percentage covered by insurance. Open Dental imports these benefits as they are. Ins Plan Subscribers: Indicates how many insurance plan subscribers use this carrier. Click the dropdown to see all subscribers. Delete: You can not delete a carrier that is in use, but you can combine carriers.